On 12.06.2011, Sunshine Stars FC of Akure in the southwestern region of Nigeria advanced to the group stage of the 2011 CAF Confederations Cup by beating Al-Ittihad of Libya 1-0. The only goal of the match was a penalty goal scored by the captain of the team, Godfrey Oboabona. Despite captaining one of the best team in Nigeria, it is very difficult to find information about Oboabona. In September 2010, http://www.punchng.com, reported that Oboabona had been with Sunshine Stars FC for five seasons. Personally, I am only able to track his career back to 2007-2008. I know that Oboabona played for Sunshine Stars FC in the Nigeria Premier League 2007-2008 and that he scored two league goals during the season. Sunshine Stars FC had an impressive season and became number four, only three points behind the champions Kano Pillars FC. The following season proved to be much more difficult for Sunshine Stars FC. However, Oboabona scored four league goals during the Nigeria Premier League 2008-2009 and was an important member of a team who escaped relegation with a hair’s breadth. According to SuperSport.com, Oboabona was one of the revelations of the Nigeria Premier League 2009-2010, scoring five league goals during a highly impressive season. Sunshine Stars FC won the bronze medal and earned the right to play in the 2011 CAF Confederations Cup. At the time of writing, Oboabona has scored two goals during the Nigeria Premier League 2010-2011. The date of birth of Oboabona is unknown to me. However, I know that Oboabona was named in a preliminary squad of the Nigeria U-20 national football before the FIFA U-20 World Cup in 2007. Most players in this squad were born in 1988, but some in 1987 and 1989. 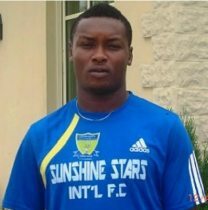 I personally think Oboabona is in his early twenties, which makes sense if he per September 2010 had played for Sunshine Stars FC for five seasons. From my point of view, Oboabona is one of the unsung heroes of Nigerian football. Oboabona, primarily a midfielder, rarely gets the headlines but he is obviously an influential player at Sunshine Stars FC. Little is known about his qualities as a player but I know that he is a very effective, hard-working and physical strong player. His energetic performances create room and opportunities for the more creative players at Sunshine Stars FC, including top scorer Ajani Ibrahim and in-form striker Sakibu Atanda. Oboabona often plays as a central midfielder with important defensive responsibilities. However, he also has the ability to attack and his goal ratio is quite impressive. Oboabona has also featured in defence and his versatility is one of the things that makes him very interesting. Oboabona has the experience and the physical presence to make it in a bigger league outside of Nigeria. He is perhaps not the typical skillful African central midfielder but this kind of player often breaks through in Europe. An interview of Oboabona can be viewed here: http://www.cafonline.com/competition/confederation-cup_2010/news/10071-sunshine-captain-our-determination-saw-us-through.html. The picture is taken from cafonline.com.